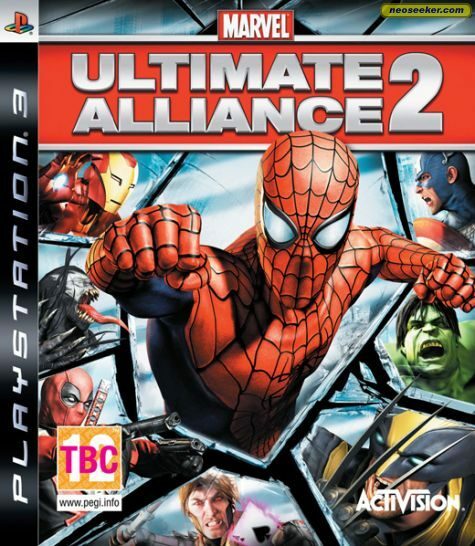 Welcome to Marvel Ultimate Alliance 2! All our favorite heroes are together again to save the world… from themselves. This is an awesome game, which is good since you’ll need to complete it twice to reach your platinum. I hope the following guide helps you out. If you have any questions or comments let me know! STEP TWO: Start a New Game + on Legendary and complete the game again! You’ll keep all your stats, characters, etc. Use this run to make up any failed levels/bosses from last playthrough. Early on, you’ll want to work for Back in Action on missions you’ve already successfully completed. Make sure to choose the opposite side of the Registration Act this time. Shortly after you choose sides, you may want to take a break and spend some time on Costume Collector, Powers of Two, United We Stand, and any of the Training trophies you may still be lacking! STEP THREE: Clean up! Once you’ve finished on Legendary, ALL missions are open to you (Pro and Anti-Reg). Replay missions through the Simulator to collect missed items and run through any Simulator Challenges you haven’t finished with your now maxed out squad. Congrats on your Platinum!!! At the very beginning of the first mission you’ll find yourself on a bridge in front of Castle Doom’s gates. Select Iron Man, run toward the statue in front of you and blast away. Once you’ve damaged it enough it should crumble, netting you your first trophy! Achieved during the Pro-Registration Campaign, can’t be missed. Achieved during the Anti-Registration Campaign, can’t be missed. Once you complete the game on Heroic or Super Heroic, you get a New Game + option to play through on Legendary. This trophy is obtained during that playthrough. This can be obtained online with a friend, or offline with two controllers. A quick and easy way to do this is to wait until you reach Stark Tower 2. Press Start on the second controller to activate co-op and enter the Simulator. In the Replay Menu, select Stark Tower 1. Once it loads up, run to the ‘Next Mission console in the middle of the room and you will be returned to the Replay Menu. Repeat this process 23 more times for your trophy! NOTE: There is a possible bug with this method wherein on leaving STARK 1 you end up having to play through the NY stages again. A good idea is to save on two separate files back and forth, if one messes up, load the other to avoid replaying these missions. Latveria, Ascension: Destroy 4 Turrets – These are easily spotted on either side of the path. Latveria, Reactors: Destroy 8 Cyborg Prototypes – The Cyborgs are suspended in giant green tubes. Hit a tube and it will start leaking, then the Cyborg will burst out. Beat him down! There are 6 on the second floor, and 2 on the 3rd. Be sure and search every nook and cranny for them, some are in hidden rooms. NYC, Factory Floors: Destroy 14 Pieces of Latverian Tech – Easy, bust stuff up! Shortly after you battle Grim Reaper, the first 12 are all found in the same room, then the last 2 are in the very next room. Washington D.C., Capitol Offense: Destroy 4 Munitions Piles – These are in the area with the fountain and the Rocket Enemies. Be sure and destroy them BEFORE you kill all 6 Rocket Enemies. Wakanda, Tribal City: Destroy 8 Teleportation Pods – These are the pods that hit the ground and spawn Leader Nanite-Enemies. Very easy. There are boxes throughout the game which give you HP and XP orbs when broken. Playing normally you’ll get this no problem. However, if you feel extra destructive, you could probably get it before the end of Castle Doom! DON’T PANIC! This trophy is WAAAAAAY easier than it sounds!! I died on Bishop on my Legendary playthrough and thought surely I’d have to play the whole game again. Fortunately, I was wrong! I was replaying the mission through the simulator to hunt collectibles and after I finished it *DING* up popped the Undefeated Heroes trophy! So, if you fail on a boss, don’t worry! You can use the simulator to replay any failed bosses for the trophy! Same as Undefeated Heroes. I died on a few missions during my Legendary playthrough and thought I’d have to play the whole game again. I was wrong! While replaying some missions through the simulator to hunt collectibles *DING* up popped the Immortal Heroics trophy! So, if you fail on a mission, don’t worry! You can use the simulator to replay any failed missions for the trophy! Easiest place to do this is in the Simulator Challenge ‘Heavy Metal’. Activate all the bots at once and pound away. Once you get a Fusion Star, pull off a Targeted Fusion to gain a Health Restore. Once you’ve got a Health Restore let a teammate die, then hold R1 and press the correct button to revive the fallen comrade. Do this 10 times! Also very easy. Load up Simulator Challenge ‘Basic Combat’ and hit Start on controller 2 to activate co-op. Now hold L2 to bring up the Fusion icons, instead of a button press on controller 1, you’ll just hit L2 on controller 2 to perform the Fusion! Lather, Rinse, Repeat. This will come naturally through playing the game. If you’re in a hurry, load up Simulator Challenge ‘Basic Combat’ and play through to the infinite spawn switches. Activate all three and Fusion away! The only ones that you CANNOT get in the sim are the Targeted Fusions, as there are no bosses or leaders. Just focus on using them as often as possible during your campaign and it’ll unlock no problem. Choose a team of 4, but focus on the first character in the line up. Perform a Fusion with each of the other 3 characters. Swap out the 3 secondary characters with 3 new ones. Continue this pattern until you’ve finished with character 1. Swap character 1 and repeat the process. NOTE: A fusion counts for both characters, regardless of who initiates. So if I use Jean Grey and Fusion with Hulk, I DO NOT need to use Hulk and Fusion with Jean Grey. Once you’ve completed the game once and started your Legendary run, play up to the point where you chose sides. Obviously, you want to pick the side you didn’t pick the first time through. Once you’ve done this enter the Simulator Challenge ‘Basic Combat’ and play until the infinite spawn switches. You now have infinite Fusion, Health and enemies to rack up kills for your costume unlocks! You’ll find Boosts hidden in missions and dropped by bosses. Also, on the Stats page, you’ll see that every character has special conditions to meet for unlocking some Boosts. There are also Boosts that unlock from the Challenge Rooms. You get different Boosts on legendary than on the other three modes. If you finish Legendary and still haven’t got it, load up the Simulator and replay missions to hunt. No real trick. Just hunt through the missions for collectibles and, if needed, replay missions through the Simulator for hunting purposes. Note that once you’ve found an item in replay, you can save the game and load it immediately after to return to the HQ with your new found items! Concept Art Bundles are ONLY found in the HQ’s. These are pretty small maps so you should find them no problem. Stark Tower: Controlling Iron Man, hit the pillar on the left side of the waterfall. White Star: Controlling Captain America, use the door with the HYDRA symbol. Fury’s Base: Controlling Nick Fury, activate the console to the right of the infirmary. Wakanda: Controlling Storm, press the panther statue on one of the pillars. Dossier – Latveria: In an alley next to the first breakable gate. Audio Log – Latverian Power Supply: Drops after killing a large group of robots. Team Boost – Team Tactics I: Back on the street, in an alley on the left before heading up a ramp. Team Boost – Resist Crush I: During the street section with live wires on the ground, fly up past a broken walkway. Team Boost – Electric I: Destroy the Doom statue in the courtyard shortly after the last collectible. Team Boost – Team Tactics III: Defeat Electro on Legendary difficulty. Dossier – Black Widow: At the first bend in the road, fly up to your left. Audio Log – Electro’s New Suit: With the previous collectible. Boost – Destructive I: After riding the elevator, head to the right. Dossier – Electro: With the previous collectible. Body Bonus – With the previous two collectibles. Team Boost – Fire Proof I: On the first circular platform in this section, break everything you can find for it to spawn. Team Boost – Striker IV: Defeat Scorcher on Legendary difficulty. Team Boost – Powerful IV: Defeat Wizard on Legendary difficulty. Body Bonus: After fighting the first super-soldier, fly up to the second window. Team Boost – Resist Impact I: Inside the third window, just past the last collectible. Team Boost – Draining I: Directly in your path near a Doom statue. M’Krann Fragment: In the door on the right that you need to deactivate the lasers for. Dossier – Lucia von Bardas: Next to a red couch just before the flickering lasers. Asgardian Rune: Afetr crossing the bridge, use the pillar to open a side room. Audio Log – Lucia von Bardas Profile: With the previous collectible. Dossier – Doctor Doom: Blow up a large munitions pile on the outside walkway. Dossier – Latverian Soldiers: On the left side of the circular platform with the three jammers. Striking Upgrade: In front of the first Tinkerer hologram. Dossier – Wizard: Next to some stairs at the beginning of this large room. Dossier – Scorcher: With the previous collectible. Focus Upgrade: In the room with the second Capacitator. Gamma Regulator: In a small room connected to the room with the third Capacitator, before heading onward in the level. Team Boost – Inferno I: In front of another Tinkerer hologram at the bottom of the spiral staircase. Team Boost – Precision I: Once you defeat the last of the 8 cyborgs in the big tubes, the last one will drop this. Dossier – Latverian Cyborg: In front of yet another Tinkerer hologram, surrounded by boxes. Audio Log – von Bardas and Tinkerer: In the same room as the previous collectible, next to the long glass tubes. Team Boost – Focused I: Defeat the Tinkerer. Team Boost – Focused IV: Defeat the Tinkerer on Legendary difficulty. Focus Upgrade: Directly at the end of the first path, behind a breakable wall. Team Boost: Super Tough I: Halfway down the second path. Power Pip Upgrade: Follow the drill after activating it, there will be a set of stairs on the left at the end of this path. M’Krann Fragment: Back at the first intersection, go left and find this at the end of the path. Dossier – New York City: Behind a forklift in an alcove on your right after the path from last collectible. Audio Log – Ms. Marvel Field Report: Behind a train car on your way to the generator. Gamma Regulator: Behind two consecutive breakable walls to the right of the generator. Team Boost – Deflection I: Blow up a munitions pile in the same room as Ms. Marvel. Team Boost – Overpower I: Defeat Shocker. Team Boost – Shock Smash IV: Defeat Shocker on Legendary difficulty. Asgardian Rune: Behind the elevator you arrive in. Dossier – Shocker: Behind some boxes in the corner of the next room. Striking Upgrade: On the right after entering the next area from the previous collectible. Team Boost – Frosty I: Behind the munition pile in the red room, off the main warehouse section. Team Boost – Ice Strike I: Defeat Grim Reaper. Team Boost – Super Tough IV: Defeat Grim Reaper on Legendary difficulty. M’Krann Fragment: After the Grim Reaper fight, search along the edge of the room. May need a flier to reach it. Dossier – Grim Reaper: Before breaking the planks to fall through the floor, make sure to grab this in the same room. Team Boost – Strike I: After destroying the last of the 14 Latverian Tech items, this will drop. Audio Log – Super Damage Insurance: Next to the final two pieces of Latverian tech, in a second-floor room with a breakable floor. Power Pip Upgrade: On top of some scaffolding just outside the room with the previous collectible. Striking Upgrade: After clearing the first section of enemies, walk past the stairs toward the next area. Dossier – Diamondback: Backtrack a bit and find this in a fountain. Audio Log – Captain America Rally: Backtrack just a bit more to find this behind the sandbag area. Dossier – International Mercenaries: Next to the downed helicopter at the front of the area with the rocket enemies. Gamma Regulator: Underneath a cop car in this courtyard. Conductive I: After blowing up the 4 munitions piles in this area, it will spawn where the first one in the area was. Team Boost – Focused II: To the left of the subway stairs. Body Upgrade: In the open next to the tracks. Team Boost – Fusion Star: Past the staircase heading down. Dossier – Washington D.C.: On the right after heading back upstairs. Team Boost – Strike True I: In the area with the large art sculpture, head to the bottom right (the camera angle will shift), then jump over the railing. Dossier – Commander Hill: On the right behind a car when you first enter the parking garage. M’Krann Fragment: Go up the stairs on the left side of the garage, this is at the top of the first set. Audio Log – Stark/Cage Phone Call: At the top of the second set of stairs on the left. Teamwork Upgrade: On the right side near the chairs. Dossier – Senator Lieber: On the left side near the chairs. Gamma Regulator: Behind a large stack of speakers on the left side of the area. Team Boost – Reserves I: Defeat Titanium Man. Team Boost – Reserves IV: Defeat Titanium Man on Legendary difficulty. Conecpt Art Bundle – D.C.
Simulator Mission – How Are De Ducks? Team Boost – Striker I: At the back of the ship. M’Krann Fragment: Toward the far end of the large open area before Spider-Woman, behind some red containers. Focus Upgrade: Behind a fence past some stairs leading into the building. Dossier – Patriot: In a room off the walkway at the back of the room. Team Boost – Ionic Attack I: Defeat Spider-Woman. Team Boost – Destructive III: Defeat Spider-Woman on Legendary difficulty. Dossier – Spider-Woman: Behind the first set of stairs you walk down. Power Pip: Fly up to the walkway at the back of the first room. Gamma Regulator: Smash all the crates near the second set of small stairs. Striking Upgrade: In the kitchen area. Team Boost – Overload I: Next to the White Star truck when heading to the generators. Body Upgrade: During a large robot battle, a side room will open. Head inside for this. Audio Log – HYDRA Training Tape: With the previous collectible. Dossier – White Star Guerillas: On the left wall when you enter the lab area. Asgardian Rune: Inside the second garage area is a smaller room with a walkway you must fly to. Team Boost – Powerful I: On top of some shelves next to the previous collectible. Dossier – Hercules: In the room with the first security switch. Team Boost – Striker II: Defeat Hercules. Team Boost – Destructive IV: Defeat Hercules on Legendary difficulty. Audio Log – Cable and Bishop: Take a right instead of heading toward the fight with Cable; at the dead end. Power Pip: With the previous Collectible. Striking Upgrade: To the left of the door to Cable. Focus Upgrade: To the right of the door to Cable. Team Boost – Deflection II: Defeat Cable. Team Boost – Rebel Yell: Defeat Cable on Legendary difficulty. Team Boost – Conductive II: Break open a water tower on the right side of this first section. Gamma Regulator: In the other water tower here. Power Pip: To the left of the two water towers under a crate. Focus Upgrade: Next to a water tower after walking down a short ramp. Audio Log – Speedball News Report I: Break open the water tower after crossing the gap via the radio tower. Team Boost – Attributes I: Defeat Prodigy. Team Boost – Fusion Combo II: Defeat Prodigy on Legendary difficulty. Audio Log – Pro-Reg Radio Spot: Turn around when you start the level. Teamwork Upgrade: Behind the yellow scaffolding where you start. M’Krann Fragment: When you move to the street, destroy a red van in this area. Dossier – Prodigy: Behind a small car in the opposite corner of this same area. Team Boost – Critical Pain I: After the first stage of the Multiple Man fight, look behind one of the SHIELD vehicles. Team Boost – Laceration I: Behind a tree during the second stage of the Multiple Man fight. Team Boost – Super Tough II: Defeat Multiple Man. Team Boost – Critical Pain II: Defeat Multiple Man on Legendary difficulty. Asgardian Rune: Behind a fan on the left side of the roof. Dossier – Multiple Man: Inside the first building, fly up to the second floor. Body Upgrade: Inside the building after the first stage of the battle with Goliath. Team Boost – Precision Force: Defeat Goliath. Team Boost – Critical Pain IV: Defeat Goliath on Legendary difficulty. Dossier – Cloak: Underneath a forklift in the first open area. Team Boost – Reserves II: Defeat Multiple Man (again). Team Boost – Adaptive: Defeat Multiple Man on Legendary difficulty. Asgardian Rune: Behind a breakable pipe on the left after the previous mini-boss. Audio Log – Reed’s Notes on Nanites: With the previous collectible. Team Boost – Empath: Defeat Firestar. Team Boost – Ice Strike II: Defeat Firestar on Legendary difficulty. Team Boost – Patriotic: Defeat Patriot. Team Boost – Resist Cold II: Defeat Patriot on Legendary difficulty. Dossier – S.H.I.E.L.D. Hellicarrier – Break open a vat after taking the elevator. Power Pip: In the other vat in this area. Team Boost – Mighty I: Defeat Colossus. Team Boost – Devouring IV: Defeat Colossus on Legendary difficulty. Team Boost – Ionic Attack III: Defeat Dagger. Team Boost – Physicality II: Defeat Dagger on Legendary difficulty. Dossier – Colossus: In the area where you first see Cap, near two vats. Team Boost – Overpower II: Defeat Captain America. Team Boost – Evade III: Defeat Captain America on Legendary difficulty. Team Boost – Draining III: Defeat Iron Fist. Team Boost – Power Up III: Defeat Iron Fist on Legendary difficulty. Team Boost – Team Tactics II: Defeat Luke Cage. Team Boost – Energized III: Defeat Luke Cage on Legendary difficulty. Power Pip: Save all five pieces of cargo before the timer runs out. M’Krann Fragment: Inside a blue container on the right alcove along the pier. Dossier – S.H.I.E.L.D. : Inside another blue container to the left of two stacked yellow containers, a bit further in the level. Body Upgrade: Tucked away between three crates in the next section after the previous collectible. Team Boost – Hands On I: Behind a fence past the entrance to the Black Widow fight. Asgardian Rune: On the catwalk in the area where you fight Black Widow. Team Boost – Shock Smash I: Defeat Black Widow. Team Boost – Killer Instinct II: Defeat Black Widow on Legendary difficulty. Focus Upgrade: Between some shelving in the room where you activate a robot. Power Pip: Inside the same room as the console puzzle. Dossier – HYDRA: With a robot helper in tow, activate the HYDRA door at the back of this section, near the red lights. Team Boost – Experienced I: On the left side of the large room here, behind two trucks. Dossier – S.H.I.E.L.D. Agents: In the room where you fight War Machine, to the left of some stairs. Gamma Regulator: On top of a car life in this same room. Team Boost – Resist Electric II: Defeat War Machine. Team Boost – Resist Energy II: Defeat War Machine on Legendary. Striking Upgrade: To the right of a ramp when progressing through the rooms. Audio Log – Bishop Calls Cable: To the left after the stairs next to the last collectible, at a dead end with some rubble. Body Upgrade: To the right of another set of stairs toward the end of the level. Team Boost – Overload II: Before attacking Bishop, smash all the crates in the room to unveil this. Dossier – War Machine: This will also drop from smash crates when fighting Bishop. Power Pip: Next to a shelving unit during the second stage of the fight with Bishop. Team Boost – Ionic Attack II: Defeat Bishop. Team Boost – Ice Strike III: Defeat Bishop on Legendary. Dossier – Ryker’s Island: Against the back wall of the first section, behind a pallet. Gamma Regulator: In the same area, inside one of the water towers. Power Pip: Inside the other water tower. Body Upgrade: Next to another water tower further in the level, just after going down a ramp. Team Boost – Frosty II: Inside a water tower just before the Songbird fight. Team Boost – Draining II: Defeat Songbird. Team Boost – Critical Pain III: Defeat Songbird on Legendary. Audio Log – Anti-Reg Radio Spot: On the left side of the roof before destroying the final AA gun. M’Krann Fragment: Behind a yellow scaffolding at the start. Team Boost – Jackpot I: Next to a red truck when destroying the three trucks. Teamwork Upgrade: Blow up the red truck next to the last collectible. Dossier – S.H.I.E.L.D. Capekillers: Behind the mailboxes across the street from the previous two. Team Boost – Precision II: Defeat Deathstrike. Team Boost – Deep Cold II: Defeat Deathstrike on Legendary. Dossier – Lady Deathstrike: Behind you when you start the level. Asgardian Rune: On the right side of the first busted out building. Team Boost – Experienced II: On the opposite wall of the Rune, behind an outcropping. Focus Upgrade: In the busted out building between the two stages of the Yellowjacket fight. Team Boost – Precise Daze: Defeat Yellowjacket. Team Boost – Deflection III: Defeat Yellowjacket on Legendary. Team Boost – Shock Smash II: Defeat Bullseye. Team Boost – Conductive III: Defeat Bullseye on Legendary. Asgardian Rune: After the acid that you need to freeze, smash a vat on the left side. Striking Upgrade: Smash the other vat next to the last one. Team Boost – Energized I: Defeat Wonder Man. Team Boost – Ionic Attack IV: Defeat Wonder Man on Legendary difficulty. Audio Log – Goliath and Cap: Destroy a vat in the same platform you fight Wonder Man. Dossier – Geffen-Meyer Chemical Plant: In a vat to the side of a horizontal breakable pipe in the next area. Dossier – Dagger: In the vat on the other side of the pipe. Team Boost – Resist Energy I: Defeat She-Hulk. Team Boost – Attributes III: Defeat She-Hulk on Legendary difficulty. Team Boost – Fire Strike III: Defeat Molten Man. Team Boost – Fire Strike IV: Defeat Molten Man on Legendary difficulty. Dossier – Molten Man: At the 4-way intersection, go straight and find this behind another horizontal pipe. Team Boost – Mighty II: Defeat War Machine. Team Boost – Cape Killer I: Defeat War Machine on Legendary difficulty. Dossier – Bullseye: Inside a vat shortly after the War Machine fight. Team Boost – Energized II: Defeat Iron Man. Team Boost – Hands On II: Defeat Iron Man on Legendary difficulty. Team Boost – Reserves II: Defeat Mr. Fantastic. Team Boost – Fusion Combo III: Defeat Mr. Fantastic on Legendary difficulty. M’Krann Fragment: Inside cell #311, but you’ll have to smash through the door and wall of the cell next to it. Body Upgrade: Inside cell #207, again go in through the cell next door. Audio Log – Speedball News Report II: Inside cell #103, and once again smash in from next door. Dossier – Prison 42: Beneath the bleachers in the gym. Dossier – Negative Zone: Also under the bleachers. Team Boost – Experienced III: On the left side of the first turret room. Team Boost – Devouring I: On the right side of the second turret room. Team Boost – Resist Cold I: Defeat Equinox. Team Boost – Disruption III: Defeat Equinox on Legendary difficulty. Team Boost – Resist Impact II: Fly up to the left in the passage after the Equinox battle. Body Upgrade: On the right of that same room, again fly up. Audio Log – Nanite Injection Training: When the laser grid comes up, head into the door on the right. M’Krann Fragment: With the previous collectible. Dossier – S.H.I.E.L.D. Nanite Network: Inside the first medical room. Dossier – Superhuman Inmates: Inside the second medical room. Asgardian Rune: Next to the terminal you use to shut off the laser grid. Dossier – Firestar: Turn around when the level begins. Team Boost – Strike True II: Defeat Grim Reaper. Team Boost – Deflection IV: Defeat Grim Reaper on Legendary difficulty. Striking Upgrade: All the way down the right corridor on level four, underneath some crates. Team Boost – Laceration III: Defeat Bullseye. Team Boost – Powerful III: Defeat Bullseye on Legendary difficulty. Audio Log – Prison 42 Emergency Procedures: Turn around when you begin the level. Team Boost – Fire Proof II: Defeat Molten Man. Team Boost – Power Up IV: Defeat Molten Man on Legendary difficulty. Teamwork Upgrade: After defeating Grim Reaper yet again, next to a computer terminal. Dossier – Moonstone: Next to one of the flame turrets. Dossier – Whirlwind: Make sure to grab this on the platform during the fight with Whirlwind and Diamondback. Team Boost – Disruption I: Defeat Whirlwind. Team Boost – Run Speed I: Defeat Whirlwind on Legendary difficulty. Team Boost – Attributes II: Defeat Diamondback. Team Boost – Overpower III: Defeat Diamondback on Legendary difficulty. Trivia machines are found in the HQ’s and each HQ has 35 unique questions. Before starting a machine, hit Start on controller 2 to activate co-op. Once you boot up a machine the question will appear with the four possible answers. The answer-button relation is randomized, however the questions sequence is always the same! Hit the correct answer on both controllers as quickly as possible for three rewards. Correct Answer, Fusion, and Perfect Score. Do this for ALL the questions in each HQ for the trophy. Simple. Hit Start on controller 2 and enter the Simulator Challenge ‘Basic Combat’. Complete the sim and exit for the trophy! All of the sim challenges are fairly simple, as soon as you have the correct team and Boosts equipped! I suggest waiting until after your Legendary playthrough before attempting them though. You’ll want high-level Boosts for some of them. Team: Jean Grey, Human Torch, Storm and Thor. Rush from one end of the room to the other while activating ALL the switches. You should have a good grouping of Robots now. Double Jump and Glide over the group with Jean and use your Triangle Power to sap their energy. Be sure and hit triangle repeatedly to enlarge the area of attack. If you run out of energy, hit the ground and use a Clearing Fusion with Thor. Once they’re all destroyed, rush back down the room and activate the switches again. Repeat this process 4 times for the Gold score. Keep your multiplier up! Use jump attacks to avoid lots of damage. When you get a Fusion Star, try and hold onto it until you get a 3x Multiplier, then do a clearing fusion on a large group of guards. It took me a few tries, but it’s not too difficult. Experiment with different boosts that fit your play style. You can use the the in-game stats menu to see the goals to accomplish this. Very, easy, you’ll likely get it without trying. Also easy. Again, use the in-game stats menu to see the goals to accomplish this. Knock down 5 foes with 1 object: Load up Wasington DC: Capitol Offense. Clear the first area, and carry a car all the way to where the downed chopper is, and all the guys climbing the wall. Look for a grouping and chuck the car at them! Robots destroyed with own grenades: Load up the Simulator Challenge ‘Heavy Metal’. Choose Jean Grey, Hulk, Thing and Venom. Activate 1 robot and use your X Power on it until it’s almost dead, then hold L2, like you’re going to use Fusion, but DON’T. This will freeze your 3 teammates allowing the Robot to lock onto you and launch a grenade. Pick it up and throw it back. It may take a couple nades, but you’ll get him! Now activate another and repeat. Alt Strategy: When it says to destroy 20 robots with their own grenade, this isn’t true, you can destroy any robot with any other robot’s grenades and you will get this. An easy place to do this is in Prison 42, where Fury says something like “Great, now the security bots come online”. You will be attacked by a swarm of small robots with a large grenade tossing robot positioned on either end of the walkway you are on. Just keep grabbing the grenades and tossing them at the little robots and you should be able to get 20 fairly quickly. Hits with Fire, Cold, and Electricity: Equip the Ice Strike, Fire Strike, and Shock Smash Boosts and go to town. You’ll get it in LITERALLY a few seconds.